If anything, the work of Sophie Calle might be best described as elusive. Whether it marks a moment of distant intrusion (following strangers on the street, working as a chambermaid examining the traces and left-overs in anonymous hotel rooms), of controlled self-exhibition (giving a break-up letter to 107 specialists for analysis, displaying unopened birthday presents) or of sheer curiosity (asking the blind to define beauty, inviting strangers to spend time in her bed), it describes in meticulous detail instants of intimacy and vulnerability, of possibility and loss. Treading the edge between private and public, between structure and chance, Sophie Calle builds her ‘performances’ around rigorous rules and rituals that allow for moments of the unexpected, for questions to remain unanswered, for quiet wonder within the mundane. 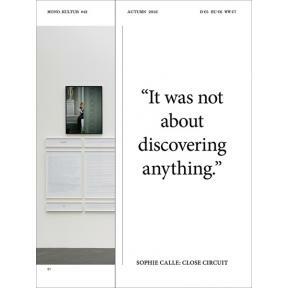 Sophie Calle has exhibited her work at the Centre Pompidou in Paris, the Whitechapel Gallery in London and the Venice Biennial, among countless others. She lives and works in Paris. In a casually and enigmatically meandering conversation with mono.kultur, Sophie Calle talked about starting her career by being lost in Paris, the pleasure in abandoning control and buying her own grave in California. Visually, the issue borrows from Sophie Calle’s penchant for structure, dividing the issue between the public in a highly aesthetic display of selected works, and the personal with a very frank conversation in a different shade of grey.